Our range of products include home made chocolate boxes, chocolate boxes, design dry fruit box, celebration dry fruit boxes, designer dry fruit boxes and dry fruit boxes. 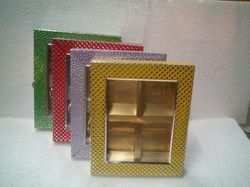 Leveraging on our experience, we offer a mesmerizing range of Home Made Chocolate Box products. These products are designed by our experts using optimum quality material and sophisticated technology in sync with international norms of the industry. Apart from this, we provide the entire range in different specifications, in order to meet varied needs of clients. Besides, clients can avail these packaging products from us in various sizes and shapes at nominal prices. 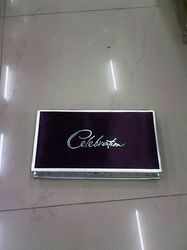 We hold expertise in this field, we are offering to our valuable clients a premium range of Chocolate Box. 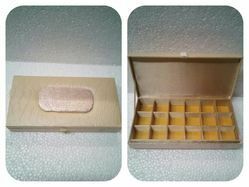 Provided boxes are extensively used in various sweet shops for packaging chocolates. The offered boxes are designed using best grade basic material and modernized technology to ensure flawless supplies rendered with international standards at clients' end. In addition to this, our offered boxes are highly praised by our prestigious clients for their listed features. 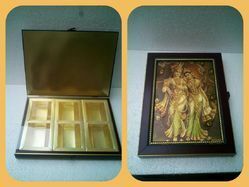 We are manufacture of dry fruit box for diwali gift packing in different types. 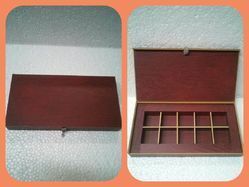 Basically we dry fruit box in molding, cardboard, MDF with rich design. 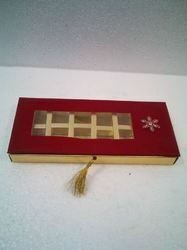 This is paper box for dry fruit packing without partition. these are very fancy and elegant design on front. All our goods are made of best materials which have the certificate from the best suppliers.We definitely produce all goods by ourselves. It is the stop service from printing, surface disposal, materail die-cutting, craftsmanship, QC, packing, delivery, therefore quality is 100%assured. Size Available in 500 gm, 1 kg, 2 kg etc. With sincerity and hard work of our professionals, we have carved a niche for ourselves in this domain by manufacturing premium quality gamut of Designer Dry Fruit Box. With enormous experience in this domain, we have established ourselves as the most reliable manufacturer, exporter, trader and supplier of excellent quality Handmade Chocolate Packing Boxes. High-grade material, brushed with advanced technology enables our professionals to design these products in accordance with contemporary trends of the industry. Further, known for their attractive design and look, our entire range can be molded as per specific requirements of the client at most reasonable prices. 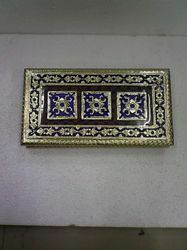 This Handmade Chocolate Packaging is made available in variety of designs, shapes and sizes. Demand of these products is increasing day by day. The packaging is designed in a manner so as to keep the chocolates safe from moisture, contamination and fungus for a long period of time. We take pleasure to introduce ourselves as one of the renowned firms, engaged in offering quality checked Dry Fruit Box. These boxes are designed using optimum quality material and sophisticated technology in synchronization with international standards. In addition to this, these boxes are checked under the guidance of quality controllers before delivery to ensure the premium quality. 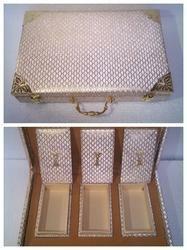 Apart from this, we provide these boxes to our clients in different colors, designs, sizes and shapes.